Editor's note: Found Object is a new recurring feature that's part writing exercise, part old guy reflections. Each entry is about a different piece of detritus that I've collected at some point in my life. My love for rock music has been a constant in my life since the late '70s, when I started listening to the radio regularly. As a young tween in the Toronto burbs, the first station I really listened to (besides listening to Blue Jays games on CKFH 1430 AM) was 1050 CHUM AM, which played a wide swath of popular music. This included rock (1979's top 100 songs list included Led Zeppelin, Cheap Trick, Styx and Foreigner) disco (Bee Gees, Village People, Donna Summer), new wave (Blondie, the Knack, the Cars, Boomtown Rats), pop (Billy Joel, Linda Ronstadt, Rod Stewart) and middle-of-the-road (Barbra Streisand, Neil Diamond, Anne Murray, Dionne Warwick). Each week, the station published a chart of its top 30 songs (and its FM counterpart did the same with a top albums chart) in the Toronto Star; I used to cut them out and still have a pile of them in the basement somewhere. I can even remember when I bought this...sort of. I don't remember the exact date or anything. I do remember that I was with my mom at an Eaton's department store in the Toronto area in late '79 and while she was off shopping for whatever boring stuff she needed, I was in the record section perusing through the stacks. I was obsessed with this song from the first time I heard it on the radio. Couldn't get enough of it. Still can't, really. I got into Jackson a year earlier when "Is She Really Going Out With Him?" came out, but this song was so uptempo and catchy, it made me a fan for life. As I mentioned, I had also started buying albums and they became the focus of my music obsession. I started getting singles again in the mid-'80s as a way to get B-sides: I've got a bunch of 45s from Iron Maiden, U2, and Def Leppard for that purpose. I would add them to cassettes of the albums they came out with. 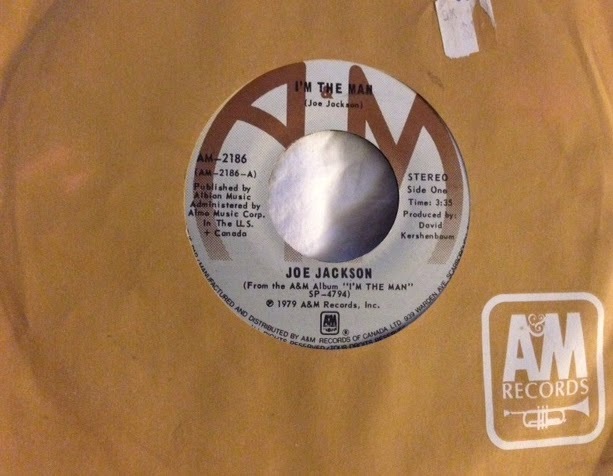 In the late '80s, I picked up a few random 45s of pop hits when I knew I didn't want to necessarily get the album. By that point, the cassingle started to pop up in stores so I picked up a few of those for B-sides. Then by the early '90s, it was CD singles. And then, of course, MP3s. Now, everything's getting pushed aside in favor of streaming. But me, I still like to own music.